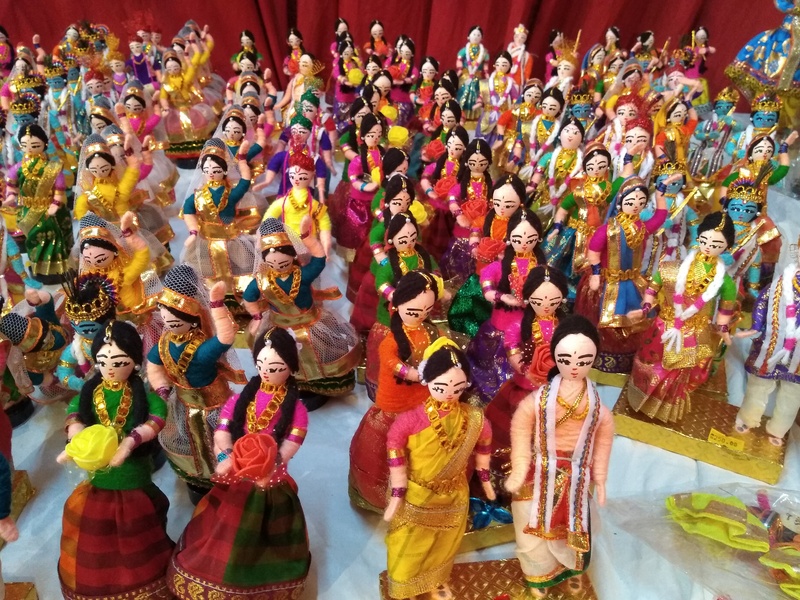 The streets in the city are full of dolls this Dasara. They are innovative not to mention beautiful. 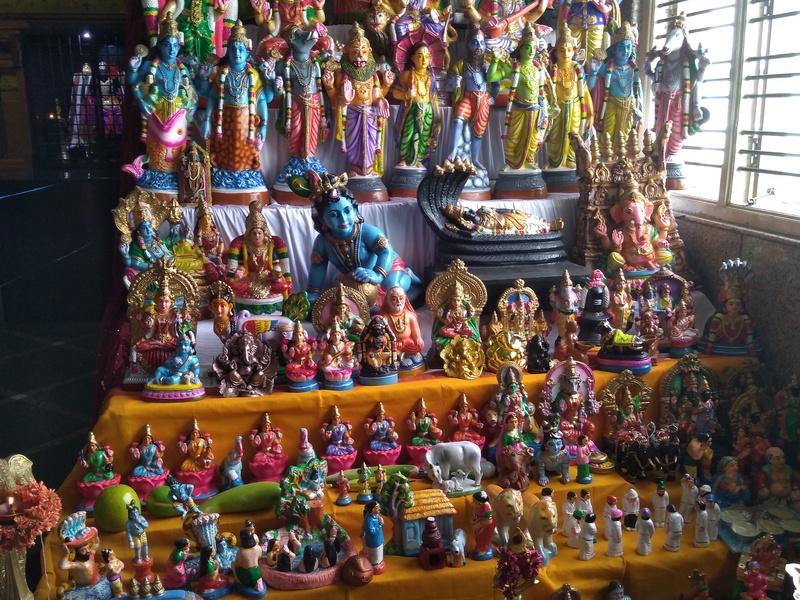 The dolls are varied- while some are figures of gods and goddesses, some depict rural life, animals, birds…. Head to the city’s markets and you will be spoilt for choices. It is not just the streets. The temples too are part of this grand celebrations lasting 10 days till Vijayadashami. The idols inside the temple are decorated with full splendor. 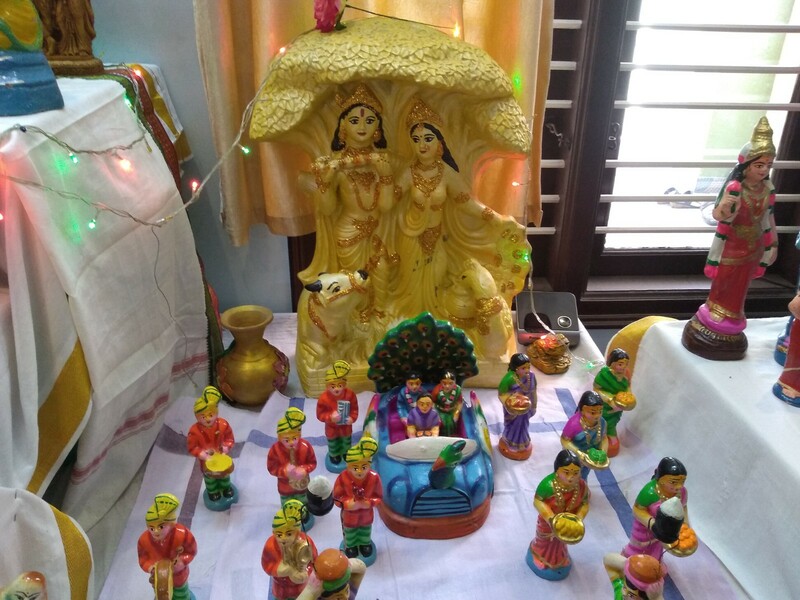 The goddess dons her different manifestations -Shailaputri, Brahmacharini, Chandra Ghanta, Kushmanda, Skandamata, Katyayini, Kalaratri, Maha Gauri and Siddhidatri representing the Navadurga of the Navaratri celebrations. 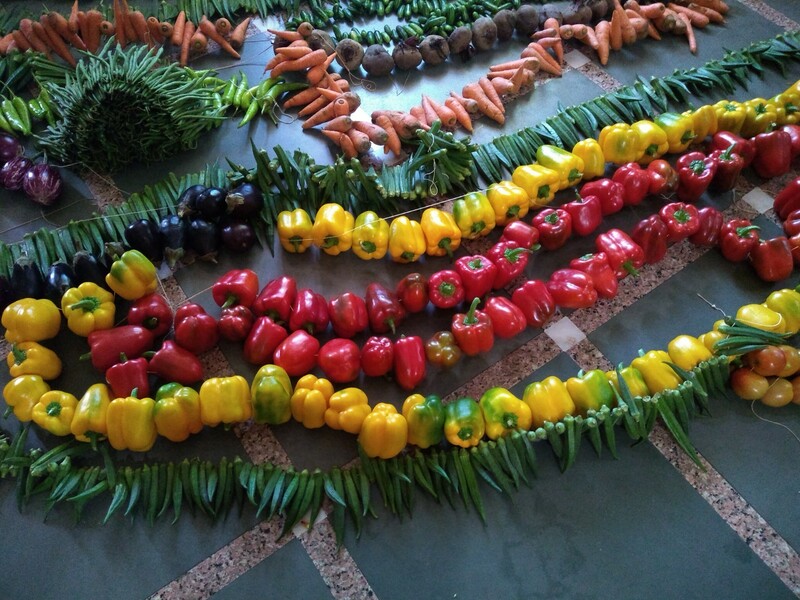 She is decorated with flowers,fruits and even vegetables. 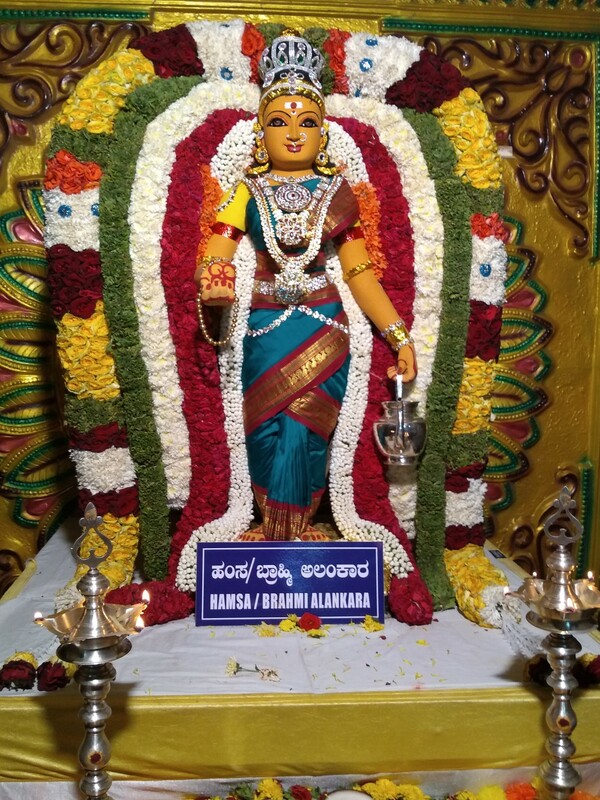 Devotees string such garlands and they get offered to the goddess. Vendors take full advantage of such situation and set up stalls outside the streets and generate a good business. 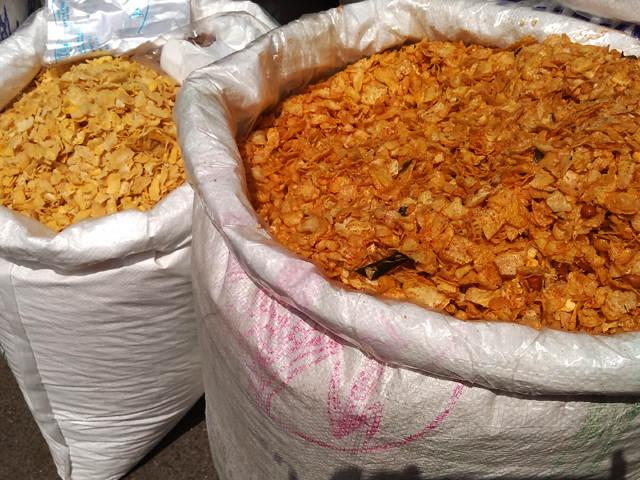 Some of them come as far as Bijapur and sell their specialty snacks. Traditions get revived too. This Dasara some homes have opened their doors to strangers so that the culture of gombe habba is understood and hopefully preserved. One of the homes in Malleshwaram that has been doing this ritual for 20 odd years explained their traditions to us. Sweetmeats and snacks are generously served to us along with strong cup of coffee and we depart to see some more displays. As you wander down the streets you notice one common feature of this festival- the colors-deep red,blue green,orange. The colors are embedded in the rangolis, the flowers used for decorations not to mention the stalls displaying the dolls. There is a festive buzz and if you wish to be a part of this celebration join us this week and the next for a delightful Dasara Walk. South Kanara is scattered with temples some 5000 of them infact. You cannot escape one even if you want to. 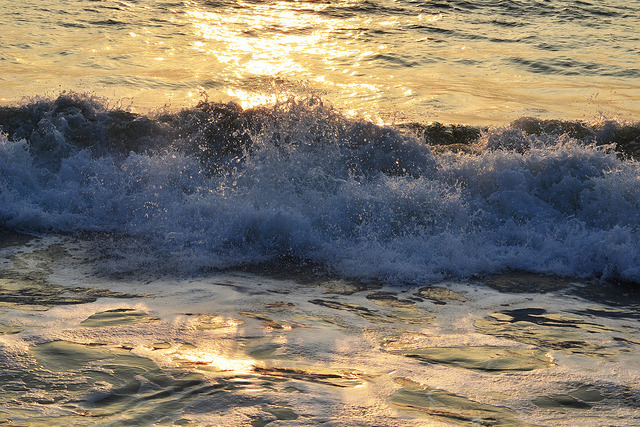 You head to the seashore and along with the roars of waves you will hear the clang of temple bells somewhere in the distance. You trek a hill and lo you will notice a small structure- a mantapa of sorts and an idol inside. You go on a shopping spree but you cannot help but see a shrine tucked in one of the saree by-lanes. So I have given up and instead I have started focusing on what type of temples these are whenever I have visited Dakshina Kannada. The temples of South Kanara look modern on the outside yet they are very much ancient some dating back to 6th century and even earlier. Just take a look at the inner sanctum , the Mukha Mantapa, the ornamental balustrades leading to the sanctum and you will know what I am talking about. The temples, be it atop a hill or on a highway confirm to certain structural parameters. They are either square,circular or rectangular. The Jain temple which South Kanara is famous for are generally of granite, located amidst scenic locations-top of hills, amidst greenery …. So a question arises, why so many temples and Jain Basadis here in the land of Tuluvas or Tulu speaking community? The answer in part lies with the rulers who ruled this part of the country from ancient to modern times. 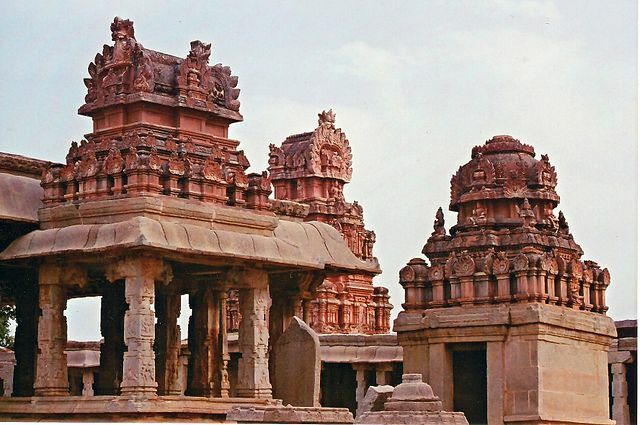 The temples had great patronage of kings be it Alupas,Vijayanagara Kings, Keladi Nayakas or local rulers like Chautas, Bangas,Bhairarasas,Ballalas and Heggades ruling South Kanara. Jainism especially had strong presence especially in 10-11th century as it was having support of Bhairarasas of Karkala and Chautas of Moodbidri. 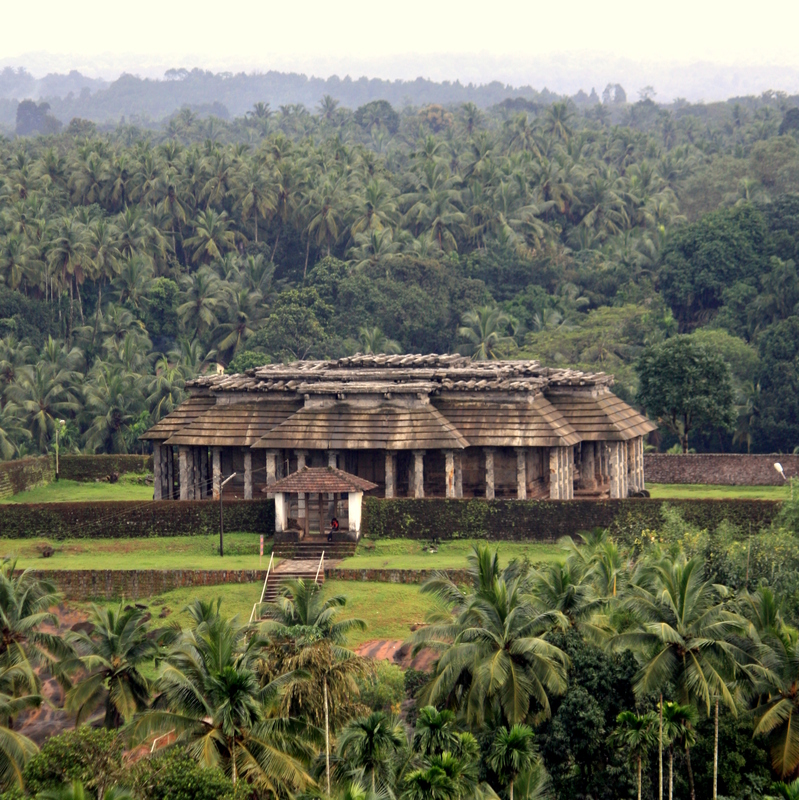 The Gomata structure at Karkala for instance was installed in 1432 by a Bhairarasas king- Veerapandyadeva. 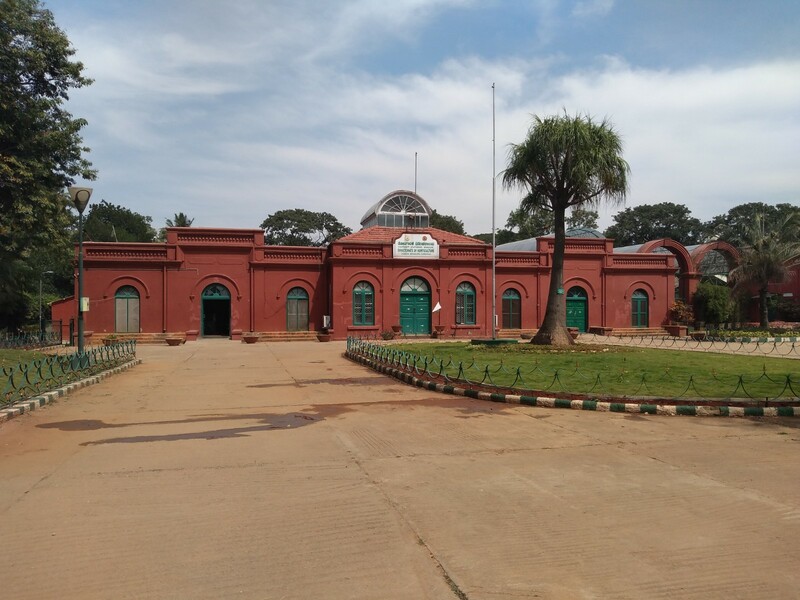 The 1000 pillar Basadi in Moodbidri was built in phases and its first phase was constructed by Chautas of Moodbidri and Ballalas in 1429. The Hindu temples too are plenty. The worship of Mahishasuramardini,Krishna, Janardana,Mahalinga and Ganesha is quite common here. South Kanara temples are generally surrounded by a big compound or Prakara made of Laterite bricks- these bricks abound in plenty. Inside the temple you will notice a Balipeeta and Dwaja Sthamba-a flag mast made of wood,covered with copper plates. You will also see a Mukha Mantapa- a hall at the entrance, then a Navaranga and then the inner sanctum. Most often rectangular temples do not boast of an inner parikrama passage while Square temples do not have Mukha Mantapa. Shiva temples on the other hand are most often circular temples. The rooftops of temples are generally thatched in villages. In some places they are covered by stone slabs and in some places they are covered by copper plates. They are generally sloped to protect against heavy rains that are quite common in the coastal areas. And chariots are generally present as every temples celebrates its annual procession and its fair in style. These structures are just not temples alone. They are part and parcel of South Kanara heritage and culture. Festivities and functions are planned keeping in mind the temple calendar of events. 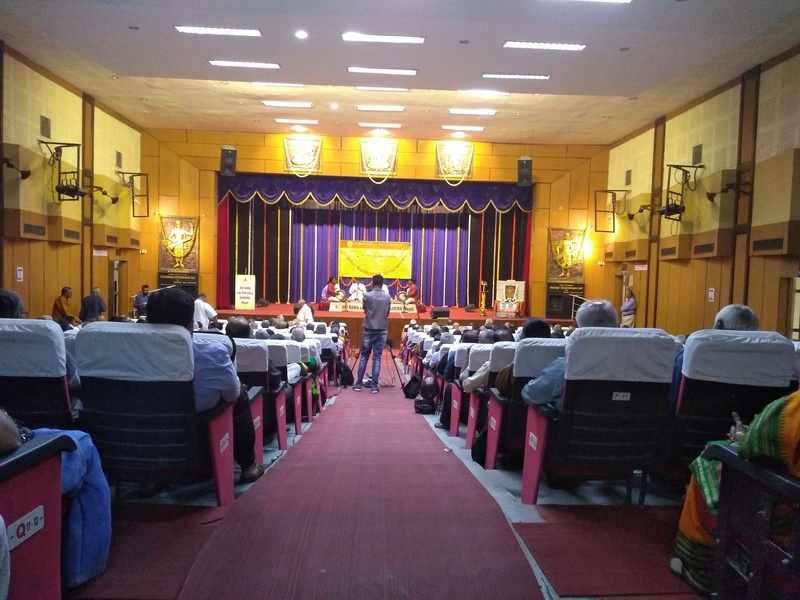 Partake of certain foods is restricted during monsoons, fasting is observed most often in the community near temples and faith has seeped itself in to the daily activities of the South Kanara People. Here temples are not just inanimate structures but represent faith and hope of the Tuluvas community. A 30 member team of Dusters gathered around Xavier’s Cathedral at 4:30 pm. The agenda was the most awaited Fraser Town Food Trail. The trail promised Syrian Christian goodies, Aflatoon cakes, Middle East Platters not to mention Biryanis. 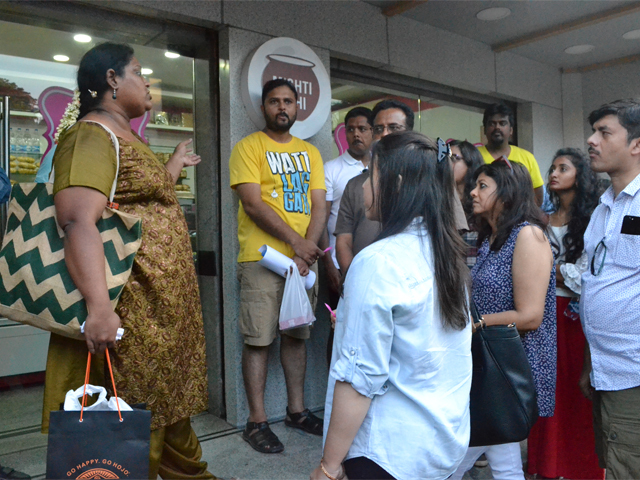 Here is a brief glimpse of the Food walk conducted yesterday. A little introduction, a brief travel in to Cantonment history at the Church, the motley group of family and kids set foot inside the church. 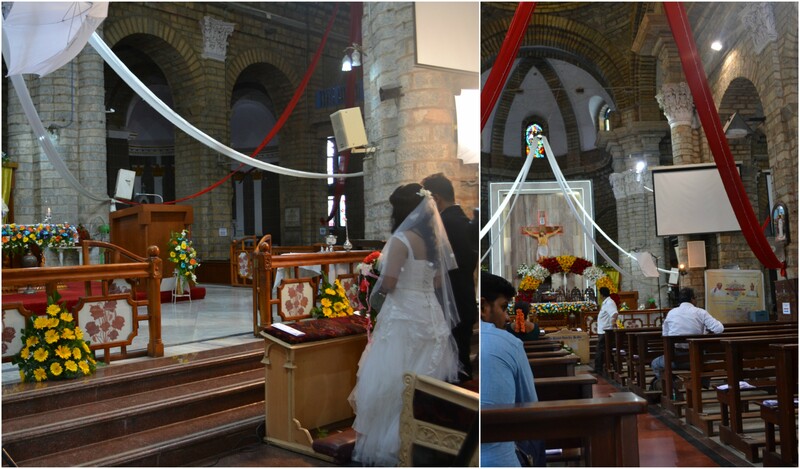 The church itself is beautiful with Corinthian Capitals, stained glass windows but with a small wedding happening it was even more so. A short glimpse of the wedding, we headed out in to the sunshine to savor some goodies. The bubbly Vidya mesmerized the foodies through her short and long tales. Finally with a satiated smile and a content stomach we dispersed. 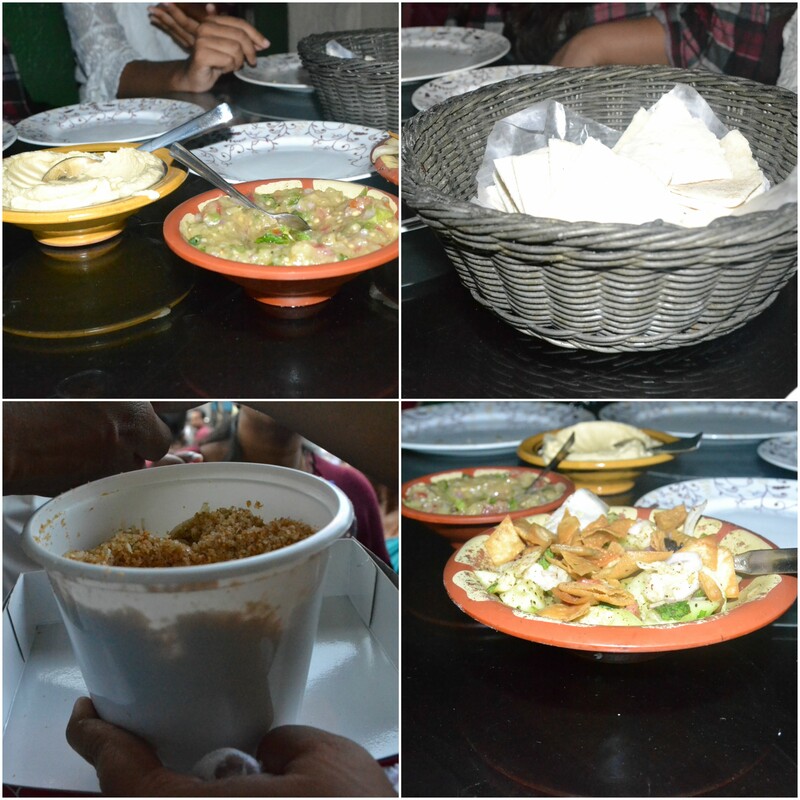 Here is a sample of treats that we gorged on. If you would like to join the fun then register for our delightful and engaging food and heritage trails. The first thing that impressed me about Bhoga nandeeshwara temple is that it has a huge temple complex. This is a rare phenomenon. 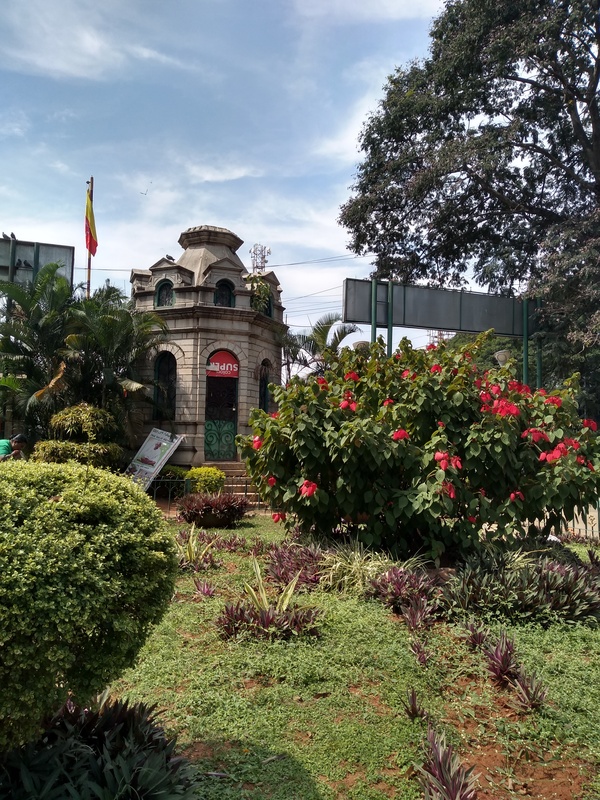 In the city of Bangalore, we have very few temples that boast impressive entrances, tanks not to mention huge courtyards. So this is a relief, even if it meant travelling outskirts for an hour or so from the city. The next thing you notice are the various peaks with varying heights forming a background finale for the temple. A sense of calmness descends on you, as you go nearer and the feeling compounds when you sight a Peepal tree filled with the talk of Parrots. Ha ..where else but outskirts of Bangalore can give you this kind of feels. As I trudge forward, I encounter a vijayanagara style pillar inside the courtyard. There are numerous temple shrines inside the complex of Bhoganandeeshwara. And the surprising fact! Five dynasties have put their energies in building this temple. But it looks like a single structure. Make a guess to as to how old the temple could be. 500 years? 1000 years? Might be, as the Arunachaleshwar temple in the Bhoga nandeeshwara temple complex has been built by Gangas . Arunachaleshwar, Bhoga nandeeshwara, Yoga nandeeshwara all are different names of Shiva. While Arunachaleshwara represents the childhood phase of Shiva, the Bhoga Nandeeshwara – a house holder and Yoga Nandeeshwara at Nandi hills that of a renunciate. The temple of Arunachaleshwara is quite calm and as you sit down in front of Linga, you know you are viewing a 10th century Linga of stone. And you feel humble almost spiritual, in the small but earthy shrine. 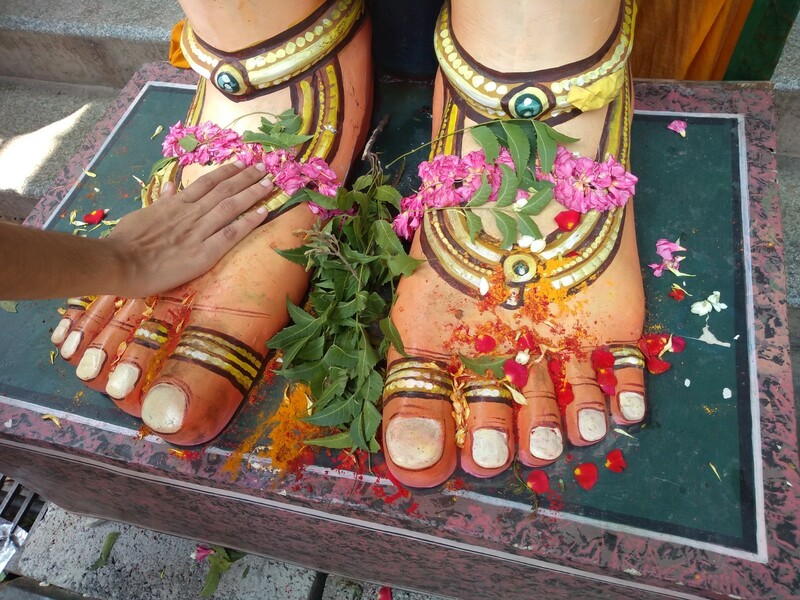 The local lore mentioned that prior to being a Shiva temple this held a statue of Keshava. But a Chola king shifted the Kesava idol from here and installed a Linga. Inside the shrine there is the statue of Simha Ganapati and below on the floor you can see the figure of Bhaire Gowda, ancestor of Kempe Gowda paying respects. Outside the shrine a lone stone Nandi, pays obeisance to Arunachaleshwara.I exit out and head to the shrine besides it- the temple of UmaMaheshwara. Built by Hoysala dynasty it is a beautiful stone structure. The pillars, walls and ceilings have beautiful carvings inside the shrine and the Navaranga outside it. Notice the four pillars inside the shrine, you will see not an inch of space left free. They depict thousands of birds, creepers, animals and gods in their spaces. 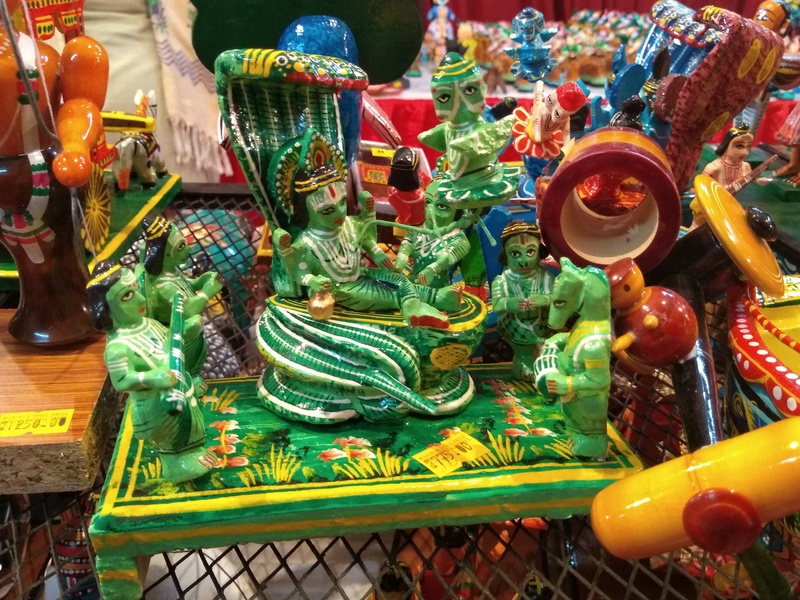 The priest explained that this shrine is popular for solemnizing marriages- UmaMaheshwar who are the embodiment of Shiva-Parvati are a happy couple. As if it to lend proof the walls of the temple have Shiva and Parvati’s marriage scenes depicted. Right next to this temple is the BhogaNandeeshwara. What a beautiful temple said to be built by Cholas. The Linga is impressive and you are filled with a sense of wonder gazing at it. A statue of Chola king is installed inside the shrine. However looking at the neck and especially the ear ornaments it looks like the statue of Jain Thirthankara. Much before the Cholas, this region was in the hands of Gangas. And they gave patronage to Jains and the religion flourished during their times. 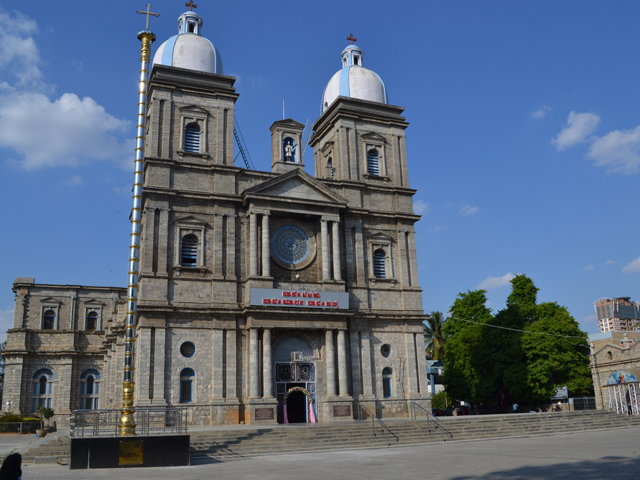 The famed Saravanabelagola was constructed by a Ganga Chieftain. So a local book mentions that perhaps Bhoganandeeshwara and the Yoga nandeeshwara above Nandi Hills were Jain Basadis that were later converted to Shiva temples by Cholas. After all that musings I head outside. A walk around and you realize that there are more structures. 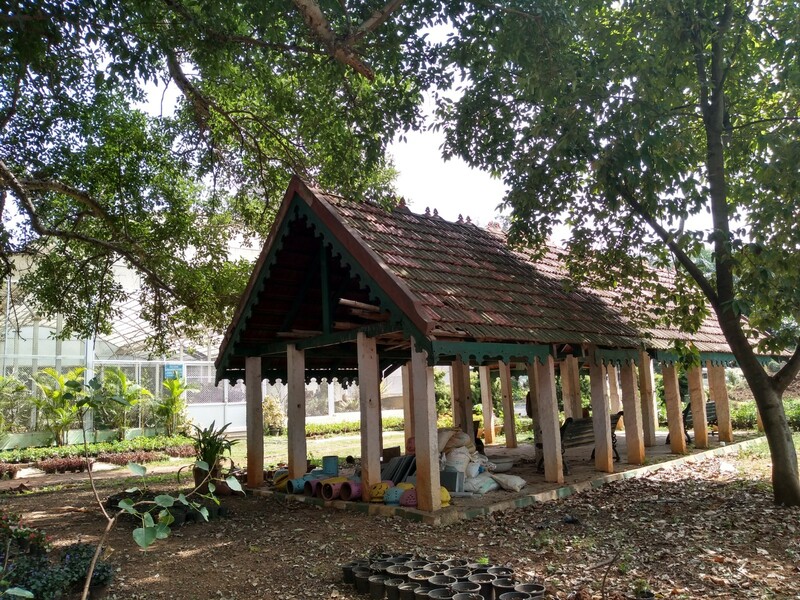 Two more temples dedicated to wife of Arunachaleshwara- Apita Kuchamba and of Shiva – the Prasanna Parvati- are present here. Once again the walls of Apita Kuchamba depict marriage scences. 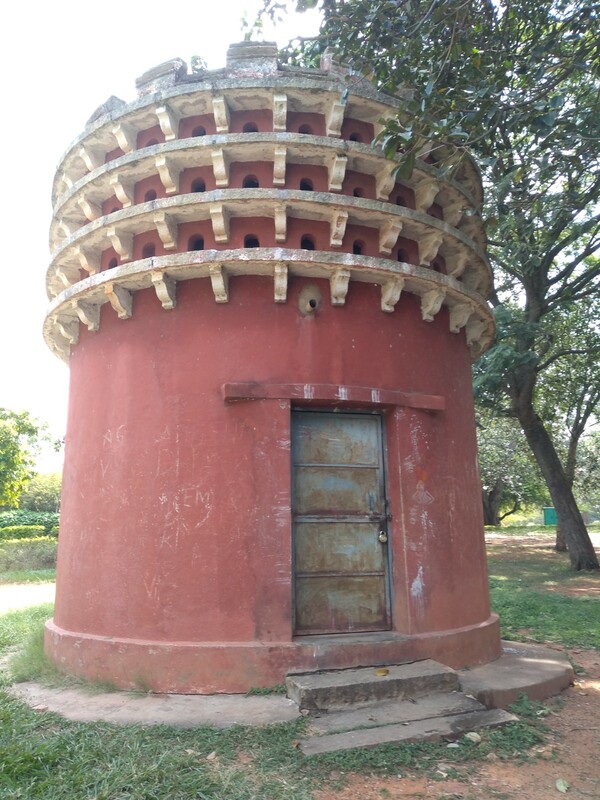 The other structures like wedding hall-Vasantha Mantapa, Tula Bhara, pillars were developed later by Vijayanagara rulers. As you go around take a look at the lattice windows, some 10 in number that provide the necessary ventilation for the temple. They are beautiful filled with intricate figures and shapes. 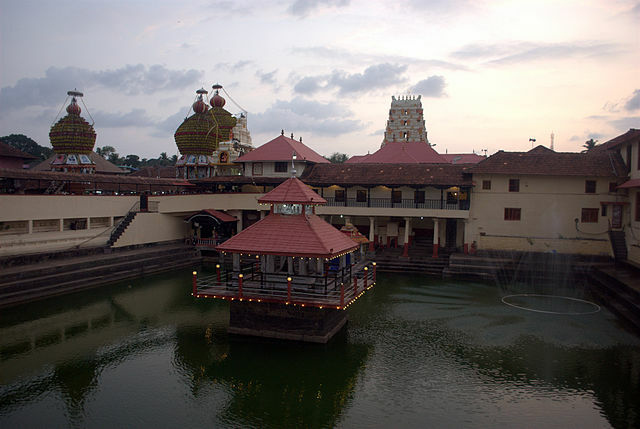 Just ahead is the Shringa Theertha- the temple tank. There are various reasons why it has got the name Shringa. Some say a saint Shringa meditated here. And some say that Nandi the bull pierced his horns- Shringa and brought out the water of Ganges at this spot. Whatever might be the reasons behind its name- the tank is beautiful surrounded by stucco figures-some in ruins, some disfigured. The distant peaks, the setting sun created an ethereal glow on the waters and the ruins-the memory of which lingers with me even today. A sign board mentions that this tank is the source of South Pinakini river. 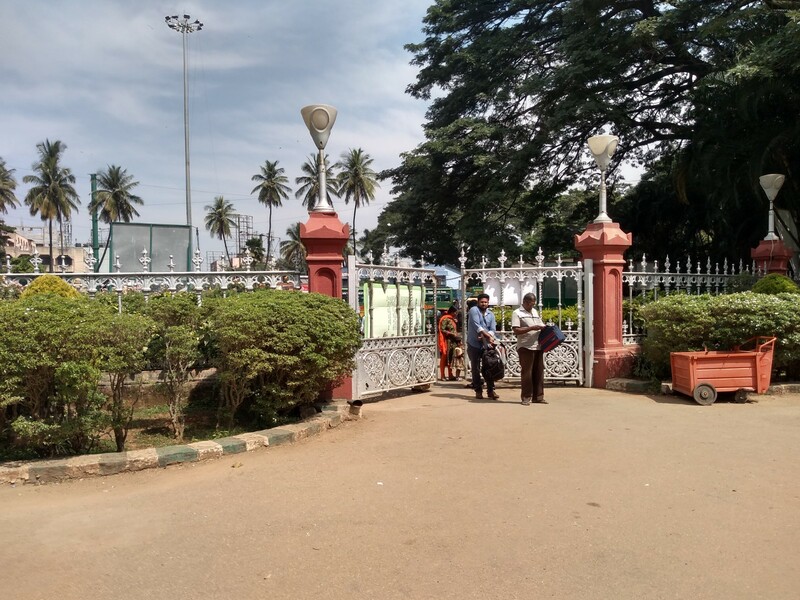 How to get to Bhoga nandeeshwara temple? Take the route towards Nandi Hills. Once you reach Karahalli Cross take a right towards Nandi grama. The temple is in this village. 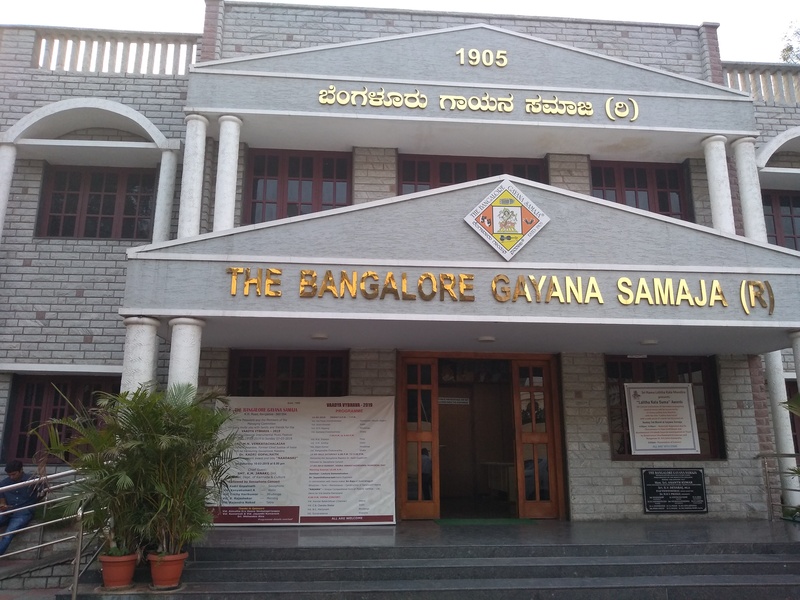 This is one of the nearest and best places to visit near Bengaluru. Or join our Temple Trails tours.